The Kettle Moraine basin of Wisconsin contains nutrient-rich soil. It is here, on company-owned certified organic farmland, that we grow strong, vital plants for use in our supplements. The crops we regularly grow include: alfalfa, barley grass, beets, Brussels sprouts, buckwheat, kale, kidney beans, oats, pea vine, and Spanish black radish. Nature has provided the foundation, and we use organic farming practices to ensure that the quality of our farmland is maintained for years to come. In accordance with our organic certification, we follow strict guidelines to grow our crops, keeping detailed records of our farming practices. 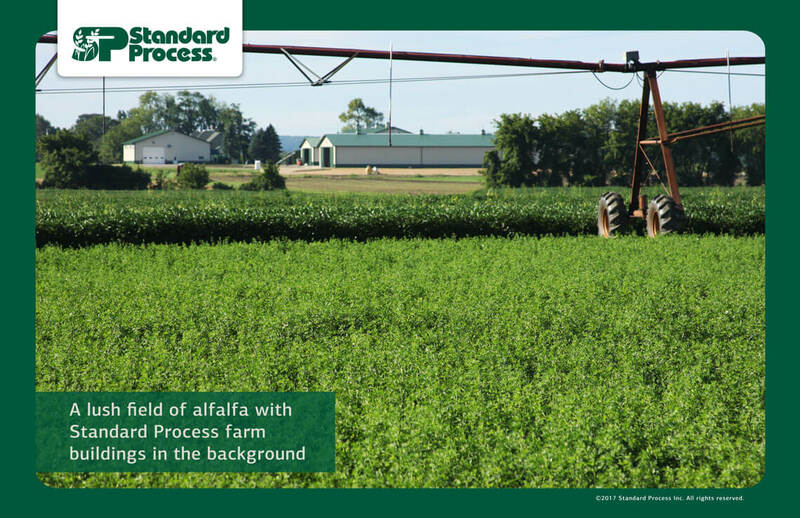 Our farmland is monitored annually by certifying agencies to ensure that only the approved farming practices are used. At Standard Process, we are involved from the moment a seed is planted through shipping the finished product to your door. Dr. Royal Lee, founder of Standard Process, said “Whole foods are the best natural source of vitamins. The key to the highest quality is the manufacturing process.” Because preserving the whole food complex is a top priority when manufacturing our supplements, we base our formulas on Dr. Lee’s time-proven philosophies. Our manufacturing process, from raw materials to finished product, takes an average of six weeks. Throughout the process, raw materials are handled in a carefully controlled environment and tested for quality. As farm operations manager for Standard Process Inc., Christine Mason is responsible for managing the company’s certified organic farm. Since joining the company in 2001, she has grown the Standard Process farm into one of Wisconsin’s largest organic vegetable farms. Christine holds a bachelor’s degree in technical agriculture from the University of Wisconsin-Platteville and has been a professional agronomist for 25 years. She is well known as a leader in the Wisconsin organic farming community. On the Standard Process farm, we use certified organic seeds whenever they are available, whether they are purchased or saved from our own farm. Untreated conventional seed is an option but is considered only after a diligent search is conducted and it is determined that certified organic seed is not available. Irrigation water is supplied from a naturally occurring artesian flowage below the farm’s surface. Our farm is surrounded on all sides by environmental buffers to minimize the impact of nonagricultural land and synthetic inputs from conventional farming practices. Standard Process utilizes composting, which is nature’s way of recycling, to increase fertility and soil health on the farm. Composting is the biological process of breaking up organic production waste from the farm’s press room into an extremely useful humus-like substance. Every week, we feature a photo taken on our gorgeous certified organic farm in Palmyra, Wisconsin. Sign up for the Farm Photo of the Week email series to receive these inspiring images in your inbox.